Maybe you’re renovating your home or having a new one built: choosing the right residential electrician is an important part of the process. You need someone who’ll deliver what he promised, on time and true to the estimate he originally provided. To ensure that part of the operation goes as planned, what you need is a full-time, professional electrician. This is an area where cutting corners doesn’t work, or comes with a high risk factor that can work out wrong. Hiring a general contractor or handyman instead of a real residential electrician, for example, can result in an estimate that’s based off vague conjecture, because a jack of all trades doesn’t do this kind of work regularly. Estimating all the measurements, amounts of materials required, and how much labor is required to get the job done is a precise art. If the person you’ve hired to do the electrics for your home makes even a small mistake in his estimate, then the costs can quickly escalate. More time and materials may be required. This headache can slow down the whole building operation. A handyman has little at stake because he’s not an actual electrician but rather just some guy who could just as easily be painting boats later that week. Hire a residential electrician from a company of professional, seasoned electricians whose whole life is based around providing outstanding electrics, all within code. 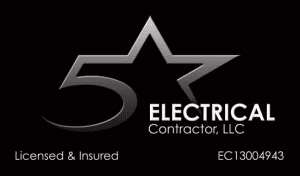 If you live in Tampa or nearby, we at 5 Star Electrical LLC are in the electrics-only business. We’re ready for any kind of job you have to throw at us. Our word and our work is our livelihood, so call us.